Climate change is widely seen as a leading problem of our times. The Intergovernmental Panel on Climate Change (IPCC), in its 2013 Assessment Report, states that “human influence on the climate system is clear, and recent anthropogenic emissions of greenhouse gases are the highest in history. Recent climate changes have had widespread impacts on human and natural systems.” The impressive ability of climate models to capture many aspects of the climate system has made them the cornerstone of all IPCC assessment reports; they are widely used to quantify the human influence on climate. However, the Earth is a highly complex system, and there remain numerous challenges to improving climate models. Three competing tensions act to increase the computational cost of running a climate model: Firstly, various processes are simplified or absent in models; addressing this requires us to increase the complexity of models. Secondly, the representation of climate usually improves with improved resolution, so there is a tendency to operate these models at as high a resolution as possible. Thirdly, climate is subject to an element of chaos. Therefore large ensembles of simulations are needed to accurately represent the most likely climate evolution and particularly extreme events such as severe storms, floods, or heat waves. For these three reasons, climate modellers often encounter limitations imposed by the computational resource at their disposal, and climate modelling can be the main motivation for upgrading ageing computing infrastructure. The aforementioned IPCC report identifies several key southern high-latitude processes that are poorly represented in contemporary climate models, including clouds over the Southern Ocean, sea ice, and Southern-Ocean heat storage and transport. These deficits affect some aspects of climate projections available for the New Zealand region. In response, and in view of the substantial investment decisions that depend on accurate information on climate change, the New Zealand Government has launched the Deep South National Science Challenge, the objective of which is to “understand the role of the Antarctic and the Southern Ocean in determining our climate and future environment”. To achieve this, a next-generation Earth System Model will be developed which, in addition to the physics of climate, also represents some chemical and biological feedbacks. Developing such a model from scratch requires a large team; on the New Zealand scale this would be impossible to achieve. The Deep South therefore partners with a major international modelling centre, the UK Met Office, and focuses its efforts only on improving selected aspects of their model, relevant to the New Zealand region. The model development will benefit from observational campaigns to be launched under the Challenge and will ultimately lead to the development of the New Zealand Earth System Model (NZESM). Simulations produced using this model will then be used to inform high-resolution limited-area downscaling simulations similar to those that have been produced for several years using international climate model projections. Such high-resolution climate projections for the New Zealand region are then taken up by various adaptation projects covering sectors of the economy including agriculture, hydroelectricity, tourism, building and infrastructure, and insurance, to name a few. The NZESM sits at the heart of the Deep South Challenge. 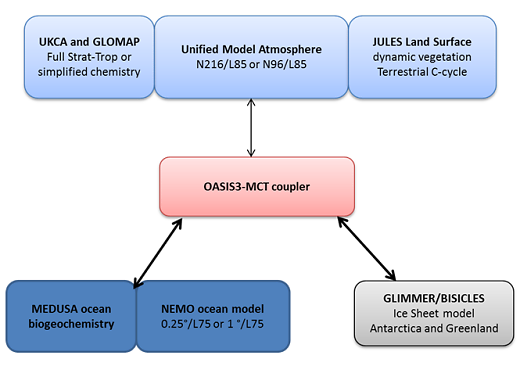 The model couples atmosphere, ocean, and sea ice modules which all have seen significant progress in recent years (fig. 1). The atmosphere component of the model comprises a whole-atmosphere chemistry package whose main aim is to adequately represent ozone and aerosol – both of which are important climate agents. Compared to the predecessor model used in the aforementioned IPCC report, the model top has been raised from 39 to 85 km. The ocean is represented by physics and marine biogeochemistry modules. Sea ice only occupies the top metre or so of the ocean but completely changes the interactions between the atmosphere and the ocean if present. The Deep South aims to improve representations of surface wave propagation into the sea ice, which breaks up the ice into floes, and also the injection of freshwater from melting ice shelves which constitutes an important aspect of the hydrological cycle in Antarctica and affects sea ice formation close to the continent. Figure 1: Schematic illustration of the UKESM/NZESM. The model in Figure 1 above comprises representations for atmospheric dynamics and chemistry, the land surface, ocean dynamics and biogeochemistry, and potentially land ice and marine ice shelves (Courtesy: Colin Jones, UK Met Office). Animation of ocean surface velocity and sea ice in an ocean/sea ice model simulation using prescribed atmospheric surface conditions at 0.25° resolution. (Courtesy: Erik Behrens, NIWA).